How many Texas congressional seats are competitive enough to merit a mention? Three, according to sayer of sooth Charlie Cook. 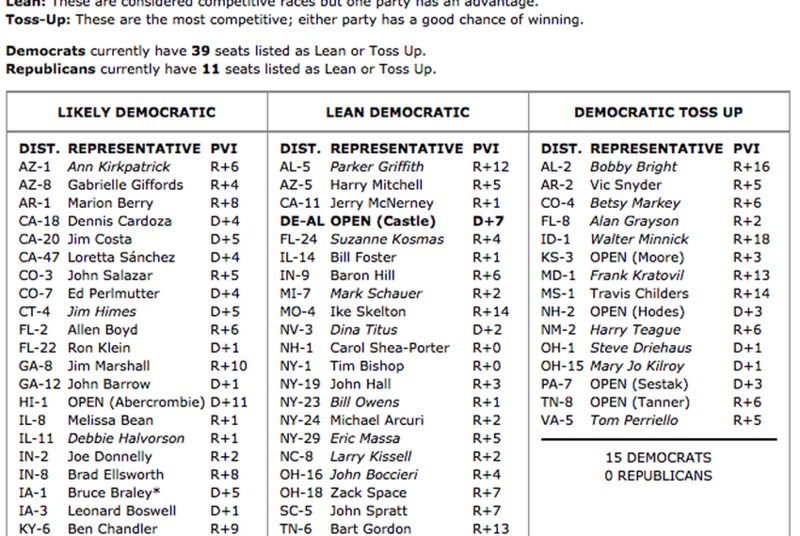 Charlie Cook, sayer of sooth and cable kibbitzer about all thing electoral, has published his latest Competitive House Race Chart — an attempt to delineate which seats are likely to remain in the incumbent party's hands, which lean that way, and which are that rare thing in politics today: a true toss-up. Naturally you'd assume, thanks to redistricting, that very few Texas seats would fall into anything other than the "safe as Fort Knox" category, and, indeed, that's the case; only a couple of the 32 make the list. Ciro Rodriguez's seat (CD-23) is judged by Cook to be likely Democratic, while Chet Edwards' seat (CD-17), is lean Democratic, meaning neither is an especially ripe target for a Republican pick-up. And Michael McCaul's seat (CD-10) is likely Republican — a sliver of hope for the Ds in what is otherwise shaping up to be a status-quo-at-best kind of year.